Sensors designed for tough dirty environments with heating for winter. Corrosion resistant metal and UV resistant plastic construction. MeteoShield Professional adds extra protection for your sensitive temperature and humidity sensors to extend their life and accuracy. 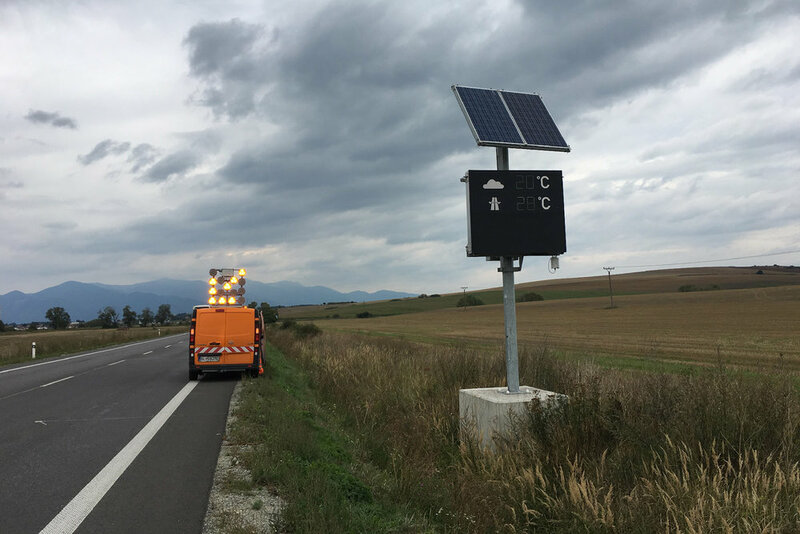 Meteorological road sign using a meteoShield professional for automatic display of accurate local air temperature. 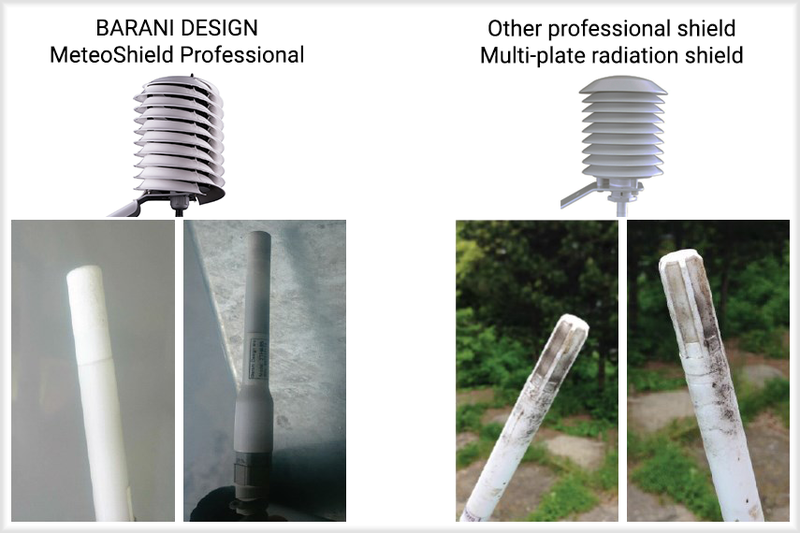 Benefits of MeteoShield Professional in long-term sensor cleanliness. Ideal for dirty & wet environments where car spray, sand and dust impact roadside sensors. Maintains temperature sensor accuracy even in extremely dirty environments. It is not affected by long-term shield dirt buildup and does not require regular cleaning to simplify your service. See black helical radiation shield test. MeteoShield -Professional's high protection rating extends sensor life of temperature and humidity sensors. See winter road radiation shield comparison. Protect your sensors and extend your service intervals and reduce maintenance. Constructed of stainless steel and UV stable pure Titanium white plastic for long service life. Heated and unheated anemometer comparison in extreme winter icing conditions. MeteoWInd unheated and heated. 20 W of heating at 24 V for strong resistance to winter snow and ice buildup or 5 W@12 VDC for solar powered wireless weather stations. Patented elliptical cup design offers superb snow shedding and high accuracy and linearity in all weather conditions. Anodized aluminum construction for corrosion resistance, robustness and long life. Intrinsically safe sensor: Low voltage 5-25 V operation and low power 4.5 mA with inrush protection. Increase your humidity sensor service intervals over traditional multi-plate radiation shields and fan-ventilated solar shields with the MeteoShield Professional. Cost-sensitive applications may use MeteoShield Standard. Reduce your system costs with a combination of MeteoWind anemometer and wind vane, MeteoTemp RH+T and MeteoShield. Increase your winter road weather station reliability with heated MeteoWind 2. Be intrinsically safe with build in safety features and very low-power consumption and low-voltage operation down to 5 V.
Easy connectivity with universal industry standard MODBUS RTU & ASCII interface. Build a complete solution with the low-power RS-485 wireless meteorological data logger EasyLogGSM.